WINNER IN THE 2014 GOURMAND WORLD COOKBOOK AWARDS IN THE BEST ENTERTAINING COOKBOOK IN SOUTH AFRICA CATEGORY. Random Struik – “Janet Kohler is a perfectionist with an attention to detail that is quite breathtaking. 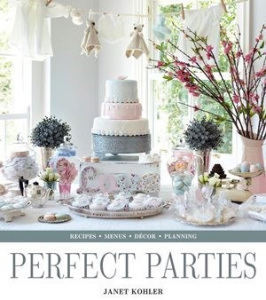 With the assistance of stylist extraordinaire Penelope Mitchell, in Perfect Parties she presents a dazzling array of inspirational party ideas, complemented by delicious recipes. Janet will also guide you through every aspect of the party, whether it’s a birthday, engagement, picnic, baby shower, wedding or high tea, or just the family Christmas celebration. From choosing a theme; through décor and preparation countdowns; right down to the step-by-step recipes – it’s all there, lavishly illustrated with beautiful photography. Most importantly you’ll sail through the event unscathed and your guests will feel really special. Originally an economist, Janet decided to follow her heart and train as a cordon bleu cook, but now as a stay-at-home mother of young children, she runs her own cookery school from her home in Durban.” Click email under contacts to order a personalised signed copy.